As a designer, it's important to know the newest fads -- but that doesn't mean you have to follow every one of them! However, sometimes a new idea comes around with plenty of staying power -- a trend that's truly worth paying attention to. 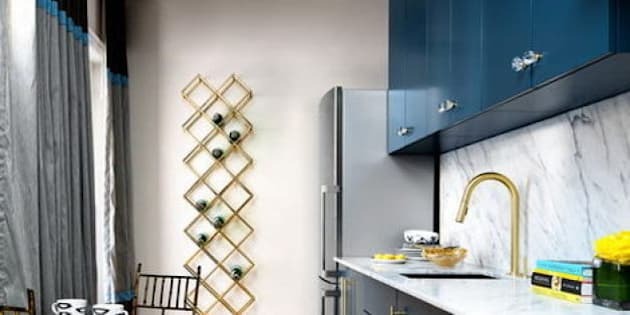 With that in mind, I put together a list of five of the top trends you should know about, with tips for how to use every one to make your space not just more hip, but truly a more beautiful home. Blue got a bad reputation for a little while: as one of the most popular colours (it seems like it's practically everybody's favourite), it ironically stopped being "cool" for a little while, with many designers running to riskier tones like pink or orange. However, blue is now back in a big way, especially in a deep, inky formi. It's especially hip when used in place of a tamer neutral, adding life to kitchen cabinetry or sofa upholstery, or on unexpected materials like leather. -Benjamin Moore Gentleman's Gray (2062-20) for a muted navy with sophisticated flair. -Naples Blue (2057-30) for a perfectly fresh, European compliment to stark white. Wireless charging may seem like an unnecessary luxury now, but in the near future, it'll seem like the obvious standard (because, afterall, traditional phone cords are already a thing of the distant past). Companies like IKEA are staying a head of the curve by already including wireless charging ports in stylish furniture, so you don't have to wait to get on board. -The cool Varv floor lamp is too timeless trends in one: the stylish built-in table is a throwback style that feels modern, and besides a charging port it also includes a USB slot for your wired devices. -The Jyssen wireless charger can be added to any furniture piece by drilling a single hole, allowing you customize other Ikea styles (or furniture from any shop, really). Simply add a wireless-compatible case to your phone and you're cord-free. We all know and love the wild, printed or patterned papers that made us fall back in love with this once forgotten wall treatment. However, the trend of wallpaper has now come back so strong people are looking to papers for even subdued, neutral applications. Texture is huge for the foreseeable future, and paper brings more tactile richness than paint ever could. -I've used natural grasscloth wallcoverings for several clients recently -- it instantly says "sophisticated manor" whether you apply it all over or just to a feature wall. Try natural, earthy neutrals, or go more preppy with a soft pink. -For a more subtle effect, try a covering inspired by slub silk, with perfect imperfections adding rippling texture that draws you in. Another echo from the past that will be a big part of the future, traditional Persian rugs add a sense of heritage to a space for an ageless quality, and play against both traditional and modern furnishings equally well (or ideally a mix of both.) Plus, they usually wear better than trendy shag-style rugs that eternally come and go. -A vintage (or vintage inspired) rug loaded with brick and jewel tones is an excellent way to add character and liveable new colour to even the most modern home. Use it for anywhere from an open concept living space to a formal dining room. With the chilly minimalism of recent decades fading, warm and inviting hues are definitely taking over on every level. Warm metals are staying hot (like gold, or the under-appreciated brass), beige-based neutrals are continuing to catch on (like warm greys), and this trend is also creeping into every other colour in the spectrum. Fall in love with olive greens, red-browns, tan leathers, and ruddy yellow, letting a hint of red or brown undertone bring new depth to every shade. -Consider a deep, rich green, like Benjamin Moore's HC-113 Louisburg Green, as a new neutral for a relaxing bedroom, kitchen cabinetry or to inspire a sofa upholstery. Pair it with navy from above for loads of natural life, or set it against pinks or oranges for a contemporary take on timeless preppy style. -For a lighter take on warm green, try BM 493 Harbour Town--it's perfect with warm woods, another sure must-have for decades to come. Got a hot design trend on your radar? Tweet or Instagram me at @yanicsimard, and visit tidg.ca for more project photos, inspiration, and my Yanic Simard selected accessory collection.